Most people considering a major home improvement project dread the idea of having to locate and then vet a contractor. So how can you really be sure that the person you’re letting into your home and onto your property is who he says he is? And, more importantly, how can you be sure that his work will meet your expectations? Make sure the business is registered. Make sure the company you’re considering is registered with the local Better Business Bureau. Right off the bat you’ll know the company is legitimate. By checking a company’s BBB record, you can find out if there are any complaints—and how those complaints were resolved. Be mindful of the size of the company when you’re considering the number of complaints it may have logged. If a 20 million dollar business has 10 complaints and a mom-and-pop business that might do 20 jobs a year has 10 complaints, it isn’t hard to figure out which one to go with. You can also visit RipOffReport.com to make sure the contractor you’re considering does business ethically. Does the company you’re considering have a brick and mortar location, or does the owner work out of his home? While nobody can knock the home-based entrepreneur, the chance of a fly-by-night (or out-of-town) operation investing in a building is slim. Look for a local company with roots in the community, and one that’s made an investment in an actual office location. That way, you’ll know exactly where to turn should you need to voice a concern. We hear these three words bantered about, but what do they really mean to the consumer? In order for the company you’re considering to do business in your community, these three things have to be in place. First, the company must be licensed to do business in the city in which you live. Second, the company must carry a surety bond, which means that if the work isn’t completed to your satisfaction the bond can be cashed and you’ll get your money back. And, finally, to get licensed and bonded a company must have insurance. There is a state minimum requirement. Make sure the company has its own labor force. A lot of companies sub contract out their work force and you have no idea who’s showing up at your house. You think you’re hiring Compay X to do the work based on that company’s reputation, but Company Y is the crew that actually performs the work. A lot of the box stores hire subs and then slap their label on the job, so you end up paying more for workmanship that you know nothing about. At Universal Windows Direct, we have all of our own employees on the job. Not only does this provide peace of mind to our customers, it also helps us to ensure the consistent delivery of quality and service. 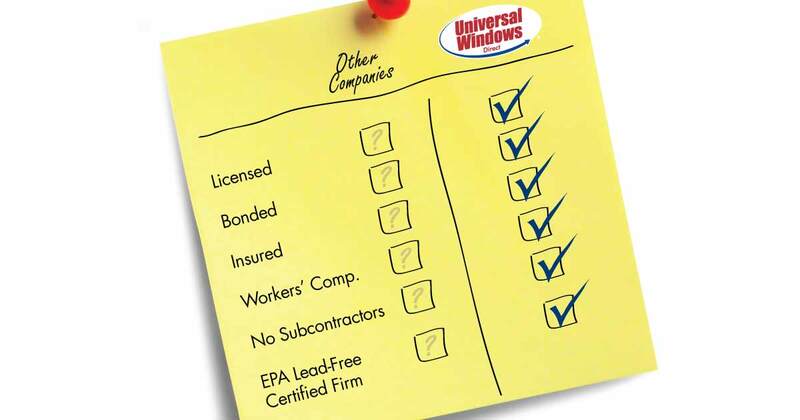 Sign up for a no-obligation in-home estimate and let one of representatives show you why choosing Universal Windows Direct for your next home improvement project will give you peace of mind.